Facebook gaming developers Zynga – they of FarmVille fame – are heading to the city next year with a new game called CityVille. With something of a nod to Will Wright's classic SimCity, Zynga is taking its tried-and-tested casual simulation gaming model to the metropolis. 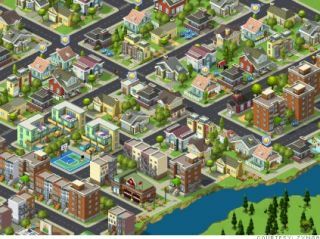 CityVille will let players become urban planners in what Zynga calls its "most social game" so far. Versions will release at the same time in English, French, Italian, German and Spanish. A beta version is due within the next few weeks, Zynga announced this week. There goes Christmas! In CityVille, gamers will be able to run restaurants and businesses, move goods around the town using trains and boats, and build schools or clear land for city expansion. The similarities with SimCity are fairly obvious, to anybody who has spend an inordinate amount of their lives lost in Will Wright's sublime urban-planning sim. Zynga hopes that its game will offer players an addition 'more social' layer, to let them interact with their friends cities – franchising businesses, exporting goods and establishing trade links. CityVille also features the first 3-D buildings and characters in a Zynga game. Zynga currently boasts over 225 million users playing its games via Facebook, MySpace, iPad and iPhone apps. Zynga creator Mark Pincus said at this week's Web 2.0 Summit in San Francisco that he wanted to "dog activate" the Web – meaning that he wants to see Zynga's dog logo everywhere.